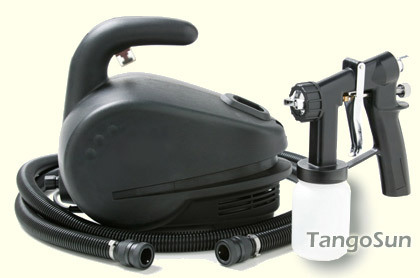 Supplied with: 14 foot (4.3 meter) flex air hose and T5020 Mist Applicator. The Whisper-Tango Kit comes with every thing you need to get started! 110 volt, 60Hz, 10 Amps,1.5 H.P. The Mighty-Mist Kit comes with every thing you need to get started! Most of the HVLP spray on tanning equipment available for sunless tanning is designed for the application of paints and finishes. They are not designed for the application of much thinner products like Spray On Tanning Solutions. They are too powerful, and the PSI is much more than needed, anywhere from 5-7 PSI at the spray tip. Two Mist Applicator choices T6000 or T5020. The Mighty-Mist™ takes UVSunless Tanning to the professional level. A high performance, rugged system it can be used equally well at home, in a client’s home, or in a high volume salon. The Mighty-Mist™ offers excellence in HVLP sunless tanning: Our Vari-Speed variable speed control provides hushed performance as well as the ability to contour and shade. Also know that this is a true HVLP system from TangoSun and Apollo. The T100 TrueSpray system is where gorgeous UV Sunless Tanning begins. Easy to use whether at home, in a client’s home, in a low volume salon or as a small business start up, the T100 gives you heavy duty air compressor tanning benefits without the heavy duty costs. Legendary technological excellence -- from the originators of the whole concept of TrueHVLP – puts the T100 way ahead of similar products. Expressly designed to meet the special requirements of airbrush tanning solutions, the T100 TrueSpray is a lightweight dream to use, and highly cost effective since the solution goes on the client, not into the air. Superbly engineered, the T100 TrueSpray Turbine motor and TrueHVLP Mist Applicator, puts perfect control in your hands. The motor produces a high volume of air (CFM) at a very low pressure (PSI). 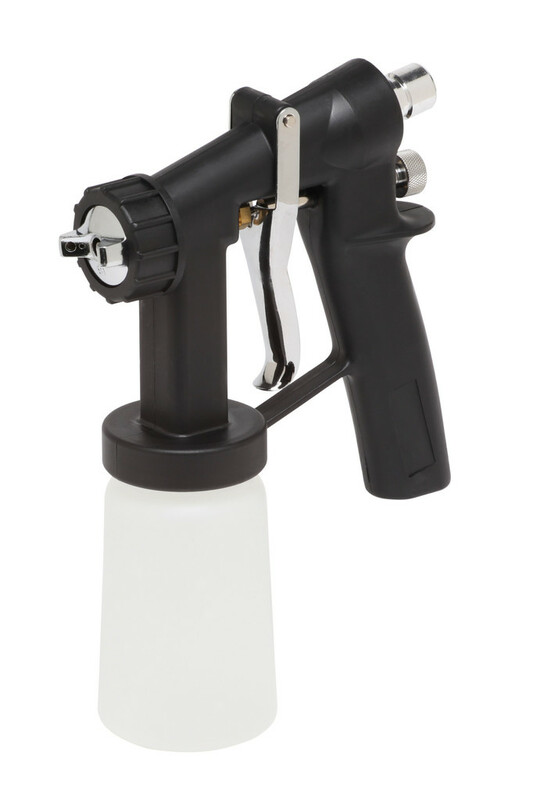 Our easy handling spray guns have all stainless steel fluid parts, so they atomize the solution into tiny perfect particles in a precision controlled spray fan. Tanning solution applies gently in a fine base layer which maximizes skin and DHA adhesion for an absolutely flawless end result. The T100 TrueSpray will get you started in the highly profitable, and high customer satisfaction business of UV Sunless Tanning. We predict that you’ll judge it to be the simplest, most wonderfully designed piece of essential beauty equipment you’ve ever known. The perfect tan is only a phone call away. Call TangoSun today and let us make it easy for you. T100 TrueSpray and You. A beautiful business idea! The Tango-T100 Kit comes with every thing you need to get started! 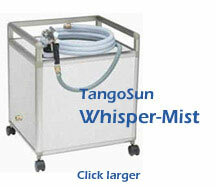 Tango Sun is a premium product from an industry innovator. Our product is a blend of humectants, herbs and the highest quality tanning ingredients available to assure you the very best. Our products are safe, non hazardous and are never animal tested. Our mission is to deliver the very best quality and remain a reputation based company of excellence. We use a patented moisturizing complex that is one of the most expensive ingredients in natural cosmetology. You will finally achieve the tan you have been dreaming of with TangoSun.. We stake our reputation as "the best on the world" on it!